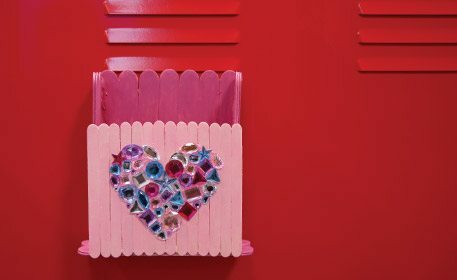 Collect all of your Valentine’s in a craft stick card holder! Decorate with a sparkling gemstone heart to show the love! Glue together (4) sets of (2) jumbo craft sticks. Glue (1) craft stick directly on top of the other. Place (2) sets of the jumbo crafts sticks next to each other and then glue one on top, attaching the two sets together. Lay (7) jumbo craft sticks on a flat surface. Glue (2) jumbo crafts sticks diagonally across the back and (2) mini craft sticks to attach the jumbo craft sticks together. Lay (14) craft sticks on a flat surface and glue (4) craft sticks across to attach them all together. Repeat Steps 3 & 4 to create one more set of jumbo craft sticks. Glue the wall of (14) craft sticks to the top of the sides. Attach the set of jumbo craft sticks from Step 7 to create the bottom. Paint the inside, bottom and sides dark pink. Paint the front light pink. Download and print the provided template. To download the template, simply click the “Template” button above. Cut out. Place the heart in the center of the front panel. Trace with pencil. Outline and fill in the heart with acrylic jewels. Attach neo-magnets to the back so you can hang it in your locker!